We Call It Monster is a story of forces beyond our control, of immense and impossible creatures that make plain how small we really are. 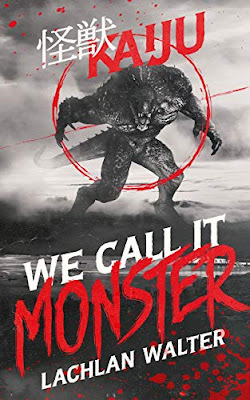 It is the story of our fight for survival and our discovery of that which truly matters: community and compassion, love and family, hope and faith.This book is about Kaiju monsters—Kaiju means abnormally large monsters—that come forth from the ocean onto land all over the world, causing destruction and death. The first chapter opens with people attending a party in the coastal city of Sydney, Australia, when they learn giant creatures are coming out of the ocean and attacking. They are baffled, frightened and even excited. There is one point where people come to watch two of the giant monsters battle each other, putting themselves in the middle of the destruction. In this current world where people take out their phones to videotape or snap photos of frightening events, it's not hard to imagine people would do exactly that. Through each chapter, time passes, and the reader learns the fate of humankind and the world after Kaiju appear. No place on the planet is safe from the behemoths as they come from the sea, come by air, and from under the ground. Human armies battle the things but are not effectual against them. Some places (at least we see how Australia changes) change, due to the monsters plowing through the land or coming from beneath the earth, bringing even new, terrifying plant, insect, and animal life. This isn't a novel with a set series of characters, this is more like short stories with different heroes and heroines. If you enjoy watching Godzilla films and other Kaiju science fiction/horror ones, like Pacific Rim, then this book may interest you. Also, if you read apocalyptic and post-apocalyptic fiction, this might be a book to add to your TBR pile. But unlike those, we get more from the POV of the humans and how they handle survival in an increasingly changing, new world. And since the new Godzilla movie isn’t out until late May, this monsterlicious book will fit the bill for you. I give We Call It Monster 4 sheep. I am a writer, science-fiction critic and nursery-hand (the garden kind, not the baby kind), and the author of two books: the deeply Australian post-apocalyptic tale The Rain Never Came, and the giant-monster story-cycle We Call It Monster. I also write science fiction criticism for Aurealis magazine and review for the independent ‘weird music’ website Cyclic Defrost, my short fiction can be found floating around online, and I have completed a PhD that critically and creatively explored the relationship between Australian post-apocalyptic fiction and Australian notions of national identity. I love all things music-related, the Australian environment, overlooked genres and playing in the garden.